Statistical and Applied Mathematical Sciences Institute (SAMSI), a National Science Foundation funded institute in Research Triangle Park, NC, sponsors a year­long research (Aug 2016 - May 2017) program on Statistical, Mathematical and Computational Methods for Astronomy (ASTRO) . This program brings together astronomers, computer scientists, applied mathematicians and statisticians. The main aims are: to foster crossdisciplinary activities; to accelerate the adoption of modern statistical and mathematical tools into modern astronomy; and to develop new tools needed for important astronomical research problems. This is timely given the flood of data into astronomy from ground­ and space­based missions at multiple wavelengths. Interpretation of the resulting complex data require diverse statistical and mathematical methods. Mapping appropriate methods when confronting large datasets is crucial. Astronomical themes identified by SAMSI include cosmology, exoplanets, gravitational waves and synoptic surveys. Each of the astronomical sub­fields could benefit from improved time series analysis, hierarchical modeling, uncertainty quantification, reduced order modeling and inference with misspecified models and will be addressed. Collaborating scientists spend extended periods (weeks to a semester) of time at SAMSI and meet regularly via webex/telecon throughout the year. 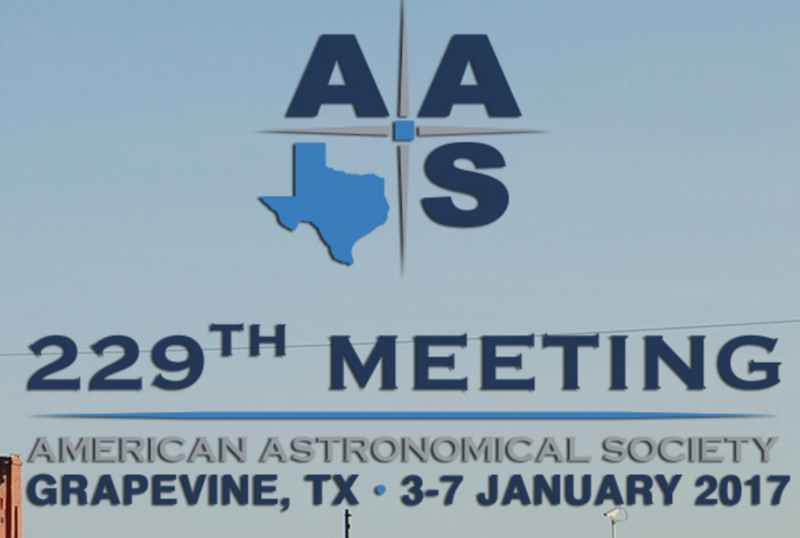 This special session is dedicated to statistical and applied mathematical methodologies in astronomy to extend the enthusiasm to all AAS astronomers and expose them to the work through short talks in order to foster collaborations. Aneta Siemiginowska (CfA, astro), G. Jogesh Babu (Penn State, stats), Sujit Ghosh (NCSU, stats, SAMSI liaison) and SAMSI ASTRO in collaboration with the members of the Steering Committee of the AAS Working Group on Astroinformatics & Astrostatistics (AAS WGAASC). A year-long research (Aug 2016- May 2017) program on `Statistical, Mathematical and Computational Methods for Astronomy (ASTRO)~ is well under way at Statistical and Applied Mathematical Sciences Institute (SAMSI), a National Science Foundation research institute in Research Triangle Park, NC. This program has brought together astronomers, computer scientists, applied mathematicians and statisticians. The main aims of this program are: to foster cross-disciplinary activities; to accelerate the adoption of modern statistical and mathematical tools into modern astronomy; and to develop new tools needed for important astronomical research problems. The program provides multiple avenues for cross-disciplinary interactions, including several workshops, long-term visitors, and regular teleconferences, so participants can continue collaborations, even if they can only spend limited time in residence at SAMSI. The main program is organized around five working groups: i) Uncertainty Quantification and Astrophysical Emulation; ii) Synoptic Time Domain Surveys; iii) Multivariate and Irregularly Sampled Time Series; iv) Astrophysical Populations; v) Statistics, computation, and modeling in cosmology. A brief description of each of the work under way by these groups will be given. Overlaps among various working groups will also be highlighted. How the wider astronomy community can both participate and benefit from the activities, will be briefly mentioned. G.Jogesh Babu is a Professor of Statistics and Professor of Astronomy and Astrophysics at the Penn State University. He is the Director of Center for Astrostatistics. He received a 2016 Outstanding Contributions to Astrostatistics Award from IAA. Jogesh Babu is the Program Chair of the 2016-17 SAMSI Program on Statistical, Mathematical and Computational Methods for Astronomy (ASTRO) August 2016 - May 2017. Statistical Methods for Characterizing Variability in Stellar Spectra. Recent years have seen a proliferation in the number of exoplanets discovered. One technique for uncovering exoplanets relies on the detection of subtle shifts in the stellar spectra due to the Doppler effect caused by an orbiting object. However, stellar activity can cause distortions in the spectra that mimic the imprint of an orbiting exoplanet. The collection of stellar spectra potentially contains more information than is traditionally used for estimating its radial velocity curve. I will discuss some statistical methods that can be used for characterizing the sources of variability in the spectra. Statistical assessment of stellar spectra is a focus of the Statistical and Applied Mathematical Sciences Institute (SAMSI)'s yearlong program on Statistical, Mathematical and Computational Methods for Astronomy's Working Group IV (Astrophysical Populations). Jessi Cisewski is an Assistant Professor at the Department of Statistics at Yale University, and is leading the Astrostatistics Interest Group at the American Statistical Association with David van Dyk and Thomas Lee. She is the leading statistician of the Astro Working Group IV: Astrophysical Populations (AP) at SAMSI 2016-17 ASTRO Program with Eric Ford. Current and future ground and space based missions are designed to not only detect, but map out with increasing precision, details of the universe in its infancy to the present-day. As a result we are faced with the challenge of analyzing and interpreting observations from a wide variety of instruments to form a coherent view of the universe. Finding solutions to a broad range of challenging inference problems in cosmology is one of the goals of the ~Statistics, Computation, and Modeling in Cosmology~ workings groups, formed as part of the year long program on ~Statistical, Mathematical, and Computational Methods for Astronomy~, hosted by the Statistical and Applied Mathematical Sciences Institute (SAMSI), a National Science Foundation funded institute. Two application areas have emerged for focused development in the cosmology working group involving advanced algorithmic implementations of exact Bayesian inference for the Cosmic Microwave Background, and statistical modeling of galaxy formation. The former includes study and development of advanced Markov Chain Monte Carlo algorithms designed to confront challenging inference problems including inference for spatial Gaussian random fields in the presence of sources of galactic emission (an example of a source separation problem). Extending these methods to future redshift survey data probing the nonlinear regime of large scale structure formation is also included in the working group activities. In addition, the working group is also focused on the study of ~Galacticus~, a galaxy formation model applied to dark matter-only cosmological N-body simulations operating on time-dependent halo merger trees. The working group is interested in calibrating the Galacticus model to match statistics of galaxy survey observations; specifically stellar mass functions, luminosity functions, and color-color diagrams. The group will use subsampling approaches and fractional factorial designs to statistically and computationally efficiently explore the Galacticus parameter space. The group will also use the Galacticus simulations to study the relationship between the topological and physical structure of the halo merger trees and the properties of the resulting galaxies. Jeff Jewell is a Senior Researcher in Information Systems and Computer Science at JPL. He is a member of the Science Data Understanding team. He is leading the Astro Working Group V: Statistics, Computation, and Modeling in Cosmology (COSMO) at SAMSI 2016-17 ASTRO Program with Joe Guinness. Recent advances in detector technology, electronics, data storage, and computation have enabled astronomers to collect larger and larger datasets, and moreover, pose interesting questions to answer with those data. The complexity of the data require the use of novel data science techniques to be used. Identifying interesting mathematical and statistical challenges and working on their solutions is one of the aims of the year-long ~Statistical, Mathematical and Computational Methods for Astronomy (ASTRO)~ program of SAMSI. Of the many working groups that have been formed, one is on Synoptic Time Domain Surveys. Within this we have various subgroups discussing topics such as Designing Statistical Features for Optimal Classification, Scheduling Observations, Incorporating Unstructured Information, Detecting Outliers, Light-curve Decomposition and Interpolation, Domain Adaptation, and also Designing a Data Challenge. We will briefly highlight some of the work going on in these subgroups along with their interconnections, and the plans for the near future. We will also highlight the overlaps with the other SAMSI working groups and also indicate how the wider astronomy community can both participate and benefit from the activities. Ashish Mahabal is a Senior Researcher at Caltech's Center for Data Driven Discovery. He is leading the Astro Working Group II: Synoptic Time Domain Surveys (TDA) at the SAMSI 2016-17 ASTRO Program with Jogesh Babu. He is also a co-chair of the LSST Transients and Variable Stars Science Collaboration.